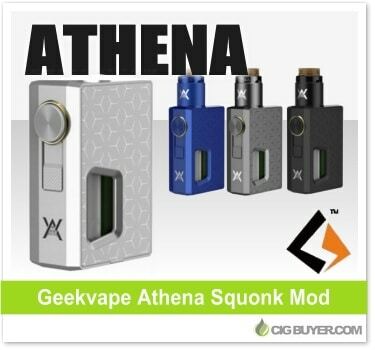 Here’s another nice mechanical squonk mod to consider – the Geekvape Athena Squonk Box Mod. Powered by a single 18650 battery with an integrated 6.5ml squonk bottle, the Geekvape Athena Squonk Mod is compact and lightweight with elegant yet subtle styling. It features a magnetic battery cover, auto-adjusting BF 510 pin and an oversized firing button with a unique safety lock to prevent accidental firing. It’s adorned on both sides with Athena branding, and a patterned aluminum body gives it plenty of style.